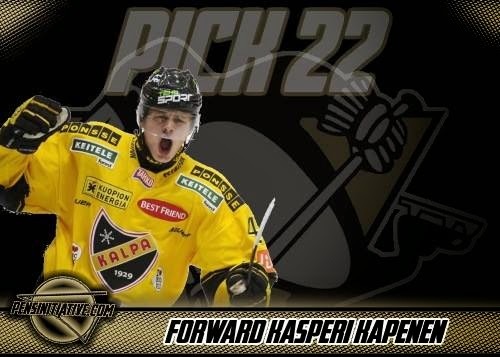 The Pittsburgh Penguins actually held on to their first round pick in this year's NHL draft, selecting Kasperi Kaspenen 22nd overall. Kaspenen was considered the best Eurpopean forward in the draft by many outlets, and is considered really good value for the 22nd pick. Multiple draft sites had Kaspenen going in the top-15 picks, some even in the top-10. That's great value for the Pens which takes a little less sting off of the James Neal trade as well as the fact that the Pens do not have picks in the second and third rounds. "Kasperi is capable of playing in all situations. What separates him from others is his ability to make critical plays that help the team win. He can do it in all areas of the game." "[Kapanen] is a dynamic offensive player ... a very good skater with a blistering first few steps and an above-average top gear. He sees the ice at a high-end level, and regularly makes all kinds of impressive passes. His ability to generate through his own skills and to set up others is what puts him here. Kapanen also has a good shot, and works hard in battles. He needs to work on his defense, and is undersized (6-0, 181 pounds) but is pretty strong." From the looks of it, Kapanen should end up being a top-six forward in a few years. Now we will get to see how these players develop differently now that Ray Shero and Dan Bylsma are no longer in town. Hopefully we will not have to worry about Kapanen being left in the minor leagues too long and playing forwards like Taylor Pyatt, Joe Vitale, and Tanner Glass over him when he's ready to play in the NHL. Too early to tell, but based on value, this was an A+ grade pick by Jim Rutherford and the Pens' front-office. Kapanen is a high-value asset. Whether he develops with the Pens or not, he gives them a nice asset for the future.